As a property manager or a landlord, performing a rental property inspection is one of the most important tasks you can have on your to-do list. And while it may not be difficult to do, it must be done thoroughly and properly. Not sure what a property inspection is or how to conduct one? 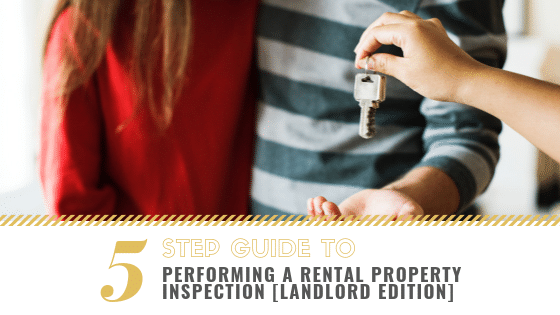 Check out our 5 step guide for landlords that need to perform a rental property inspection. Before you worry about the specifics, it’s important to know when you should do a property inspection and why it’s a step that you can’t afford to skip. You should conduct a property inspection every time a tenant moves out of your property. It’s your chance to do a complete inspection of the unit and look for any damage that your tenant may have caused. Do your property inspection before you return your tenant’s security deposit. That way, if the tenant is liable for damages, you can deduct those funds from the security deposit payment. Do not let tenants move in without paying a security deposit, and do not let them have their deposit back until you’ve checked that no damage has been done. If your tenant has caused damage that exceeds their security deposit, you can ask them for more funds or proceed through legal channels. But in order to do this, you’ll need to be able to prove that the inspection process was proper and thorough. If it isn’t done right, you could end up footing the bill. Keep reading to learn about the basic steps to performing a rental property inspection. Keep in mind that you must do these steps in every hallway and every room of the unit. Check your ceilings for smoke damage. It’s not smart to let your tenants smoke in your unit, but if you let them or they did so anyway, you may see signs of damage on the ceilings. Smoke damage can darken your ceilings as well as any molding you may have. Inspect the ceilings in every room and make sure you do so in good lighting. If you have darkened ceilings caused by smoke damage, you may need to re-paint before your next tenant moves in. While you’re viewing your ceilings, it’s a good idea to check that your smoke detectors are in proper working order. Are your hardwood floors scratched? Are your carpets ripped or stained? Check baseboards, carpeting, and wood floors for any type of damage your tenants may have caused. If your unit does not allow pets, make sure that there aren’t any pet stains or claw marks. If you find them, these are signs that your tenant may have had an illegal animal or two in the unit. In the event that you should find claw marks or pet stains, look closely at your walls as well, especially lower areas. It’s possible for both dogs and cats to leave urine stains or scratch marks on the walls. It’s essential that you do a thorough inspection of your windows. Windows are easy to damage, and it’s important to have safe, secure windows in place before your next tenant moves in. Look at the screens for rips and tears. Check to see that all the windows open and close the way they should. Make sure that all the locks are in proper functioning order. It’s also wise to check the windows from the outside to make sure that there are no signs of forced entry into the unit. A thorough check of your windows will keep your property protected and provide safety for future tenants. Check every bathroom, toilet, sink, shower, and baseboard for signs of water damage, discoloration, and mold. Make sure that you look closely at tiles, and surfaces around bathroom fixtures and sinks, as well as at any outdoor plumbing you may have. Check pipes for leaks and drips and look for any sign that water may have damaged your walls, ceilings, or floors. It’s also important to check for water damage in and around your windows. Mold builds up easily and quickly, so address any issues immediately and hire a professional to remedy any problems you find. Have a camera handy as you do your rental property inspection and take photos and notes every step of the way. Even if there is no damage, it’s best to have the photos so you know what the condition of the unit is before you turn it over to the next tenant. Pictures that don’t show damage also come in handy if you ever find future damage, as you’ll have something to compare it to. In the event that you have to file a dispute with a vacating tenant, pictures will be key. You’ll need good photos as evidence in case you have to file a civil suit or sue for damages. We suggest taking photos on your smartphone or tablet to ensure that they will be time and date stamped. This is critical if you ever need to use them in court. When you’re doing a property inspection, take your time. Be thorough and don’t overlook any important details. Check your ceilings for smoke stains, water marks, and other damage. Inspect your floors, baseboards, and any molding you may have. Check that your windows function and lock and look for signs of water damage around windows, bathtubs, sinks, and pipes. Take pictures of everything as you go – including those areas with no visible damage. Performing a rental property inspection is essential every time a tenant moves out. If you have a tenant who’s occupying the unit for an extended period of time, schedule a time to do a property inspection once every 1-2 years. Every landlord wants a good tenant who rents their unit for years on end. But just because they’re paying rent doesn’t mean they’re taking care of your property. Don’t wait until they leave to find that they’ve been causing damage or neglecting your property year after year. Remember, a small problem now can easily turn into a big problem down the road if you don’t address it.